Technically speaking the so-called "White Nights" are not unique to St Petersburg, but only here have the northern nights received such a poetic acclaim. What could be more romantic than walking along rivers and canals when night is as bright as early evening? It is the world's only metropolis where such a phenomenon takes place every summer. Every year there are days when the downtown St Petersburg is full of people, even at night. It is a great time for those in love and ... for High School graduates who usually get their diplomas about June 21-22. From late May to early July nights are bright in St Petersburg, but the real White Nights normally last from June 11 to July 2. The nature of the White Nights (Beliye Nochi) can be explained by the geographical location of St. Petersburg. It is the world's most northern city with a population over 1 million. St Petersburg is located at 59 degrees 57' North (roughly on the same latitude as Oslo, Norway, the southern tip of Greenland and Seward, Alaska). Due to such a high latitude the sun does not go under the horizon deep enough for the sky to get dark. The dusk meets the dawn and it is so bright that in summer they do not turn street lighting on. If the weather is cloudy you might not see any White Night, though on a clear day you can get a feel for a White Night even in mid-July. Bonne chance! 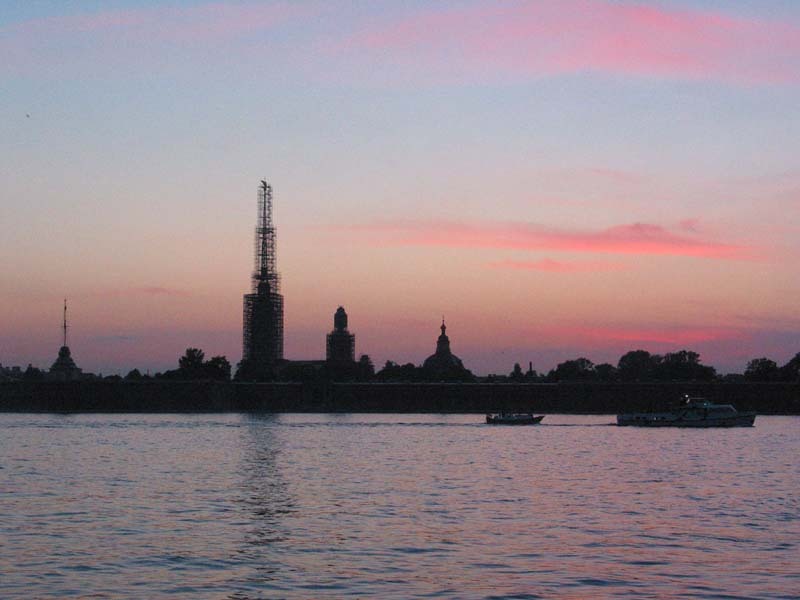 Peter and Paul Fortress during the White Nights, 11 July 2002. The Peter and Paul Cathedral, which remains the tallest structure in the city, is undergoing renovations and is shrouded in scaffolds in anticipation of St. Petersburg's 300th birthday next year, like many other buildings in the city. Very early in the history of St Petersburg the Strelka (spit) of the Vasilievsky Island, the largest island of the Neva delta, was intended to become the heart of downtown St Petersburg. Some of the buildings, such as the Customs House, still remind us of that time. Eventually, the downtown moved onto the left bank of the river, but the early 19th century architects did not forget about the Spit of Vasilievsky Island. Neither did the Tzars, since the area could be clearly seen from the royal residence - the Winter Palace. In the early 19th century one of the most elegant architectural ensembles of St Petersburg emerged on the eastern edge (Strelka) of the island. The imposing white colonnaded building of the Stock Exchange became its focal point, and was flanked by two Rostral Columns. The Stock Exchange, designed by the French architect Thomas de Tomon and built in 1805-10, was inspired by the best examples of Ancient Greek and Roman architecture. The two Rostral Columns, studded with ships' prows, served as oil-fired navigation beacons in 1800s (on some public holidays gas torches are still lit on them). The eastern edge of Vasilievsky Island, adjacent to the Strelka, is one of the cultural and intellectual centers of the city, with St Petersburg State University, the Academy of Arts and a number of museums, including the Navy museum, located in the building of the former Stock Exchange. The Strelka also has one of the best views in the city: you look left to the Peter and Paul Fortress and right to the Hermitage, the Admiralty and St Isaac's Cathedral. 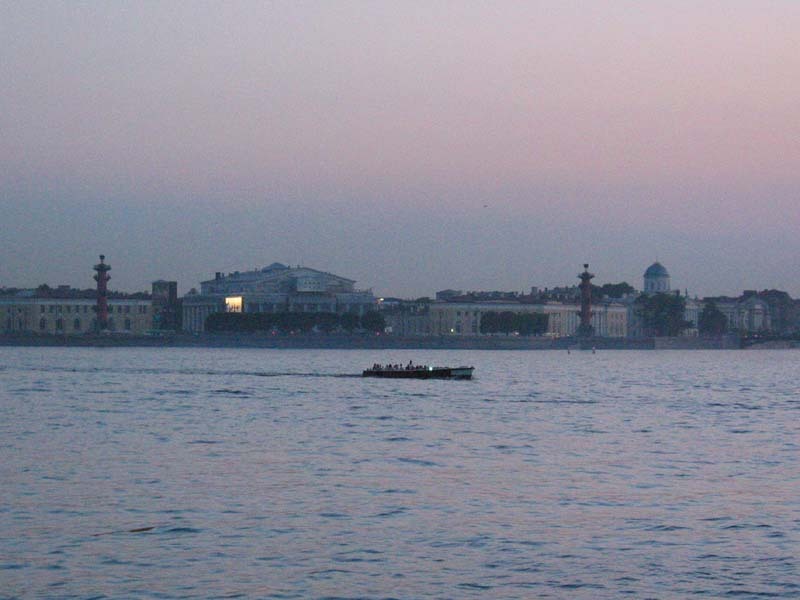 The Strelka of the Vasilievsky Island and the two Rostral Columns during St. Petersburg's white nights.